Are Populist Masculinity Celebrities Fake News? I have previously proposed that populist masculinity in the Trump era functions as a pyramid scheme with Trump at the top, surrounded by his wealthy cronies. Below Trump exists a class of populist masculinity celebrities who sell Trumpian values down to the base of the pyramid, which comprises the much-famed “white working class” and its various economic and racial permutations. The pyramid is held together in part by a healthy dose of carnivalesque spectacle and the promise/threat of disorder that keeps adherents both entertained and on edge. Seen as a whole, the pyramid appears to make sense, with a natural flow of ideas moving from the top to the bottom, and from the bottom to the top. However, if we look only at the top and the bottom of the pyramid, things look more confusing. At the top we have a billionaire, at the bottom the poor and/or ideologically disenfranchised. Why and how should these two groups connect, when a relationship between them seems so counterintuitive? In order for Power—whether embodied in Trump’s ego, the Deep State or dark money—to mobilize the masses, the void between the top and the bottom must be bridged. Populist masculinity celebrities serve as an ideal bridge between the top and the bottom, being at once vaguely connected yet separate from both. However, there is a qualitative difference between these three groups. At the individual level, Trump makes sense, inasmuch as he follows a trajectory spanning many years in business and entertainment. Equally, at the systemic level, Trump is a recognizable agent of wealth and power. The “white working class,” whose long history is told admirably by Nancy Isenberg in White Trash: The 400-Year Untold History of Class in America, is also recognizable and understandable. However, like many things in our era of fake news and alternative facts, populist masculinity celebrities make less sense. Indeed, it is tempting to speculate as to whether or not the momentum of populist masculinity celebrities is actually “real” at all. In a recent episode of Homeland called “Sock Puppets,” Max interviews for a job with the right wing media personality Brett O’Keefe, who appears to be a composite character based on Alex Jones of Infowars and Steve Bannon in Breitbart mode. On securing the job, Max discovers that O’Keefe’s operation runs a vast network of online sock puppets that support right wing views on social media. Who knows if such sock puppet farms exist, but the scenario will make intuitive sense to anyone who monitors the online presence of populist masculinity celebrities, who appear to enjoy engagement in volumes well beyond that which seems plausible. For example, Infowars contributor Paul Joseph Watson has over half a million followers on Twitter and nearly 900,000 subscribers on YouTube. He frequently refers to his social media engagement as proof of how his worldview resonates with regular people (the base of the populist masculinity pyramid). Mike Cernovich has 230,000 followers on Twitter and also appeals to his social media engagement as demonstrating the acceptance and popularity of his worldview. 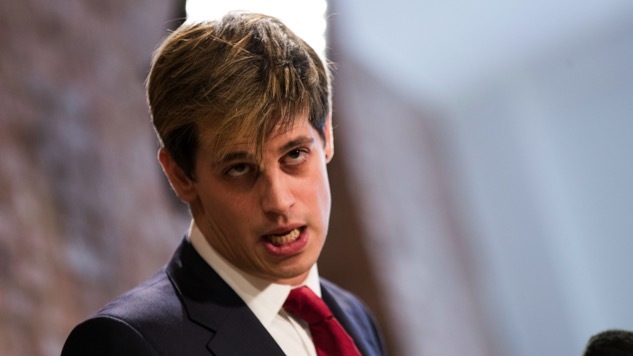 Milo Yiannopoulos has recently topped 2 million followers on Facebook and has over half a million subscribers on YouTube. The content of these populist masculinity celebrities is shared wildly within hours—or even minutes—of being posted, giving the impression that there are armies of people cheering them on. Perhaps those people do actually exist, or perhaps there is a sock puppet farm doing the legwork? These questions are plausible given that recent findings show there are almost 48 million bots on Twitter coupled with the increasingly sophisticated political manipulation of social media by companies such as Cambridge Analytica. You might be inclined to point to the real life events of Yiannopoulos such as his campus tour and note that crowds cannot be created out of thin air. This is true, but Yiannopoulos’ tour was supported by Breitbart: students turning up for a free show on campus hardly constitutes a political endorsement on their behalf. The plausibility of populist masculinity celebrity looks even more questionable when we compare it to the social media footprints of progressive luminaries. Are we expected to believe that in a relatively short period of time populist masculinity celebrities have garnered a similar traction to the likes of Naomi Klein or Glenn Greenwald? Of course, it’s certainly possible this is true, due to mastery of the medium—in which case, credit where credit is due—but it stretches credibility. And then it is interesting to look at those populist masculinity celebrities who for some reason have not scaled their success in the same way as others. Roosh has nearly 34,000 Twitter followers and nearly 30,000 subscribers on YouTube. These numbers are impressive by “normal” standards, but not compared to others in his class. Are we expected to believe that Roosh, whose philosophy—while objectionable—is far more coherent than most populist masculinists, and whose followers appear more devoted and “real” in comparison, is so many times less popular? Or perhaps Roosh for some reason has not been allowed access to the imaginary sock puppet farm? One thing we do know is that wealthy individuals invest in information infrastructure to support their ideas, as documented by Jane Mayer in Dark Money: The Hidden History of the Billionaires Behind the Rise of the Radical Right. Such dark money may already have played a role in moving the needle in public perceptions of masculinity. Interestingly, Mayer’s most recent dark money investigation centered on Robert Mercer who has invested in Breitbart and Cambridge Analytica, both mentioned above. Developing momentum behind ideas is crucial. Whether real or imaginary, momentum at some point creates a tipping point that propels ideas into the mainstream: Yiannopoulos is interviewed on Real Time with Bill Maher, Cernovich is interviewed on 60 Minutes, and Watson is refuted in The Independent. At this point, any question of the provenance of such celebrity is irrelevant, as a new reality has been built. It is too late to put this genie back in the bottle. If such sock puppet farms actually exist, it is unlikely progressives will ever have the resources to counter like with like. Still, there are lessons to be learned from conservatives in terms of building infrastructure around ideas, and acknowledging that traditional “facts” are not powerful enough on their own, but have to be situated in realities that are, like masculinity, socially constructed. Joseph Gelfer is an author whose books include Masculinities in a Global Era (Springer Science+Business Media, 2014) and Numen, Old Men: Contemporary Masculine Spiritualities and the Problem of Patriarchy (Routledge, 2009).